As part of Little League’s annual National Little League Week celebrations, the first-round pairings for the 2015 Little League Baseball® World Series are set. On Wednesday, June 10, at Little League Headquarters, members of the State College Little League Challenger Division and their buddies drew the U.S. and International Bracket match-ups that will take place on Thursday, Aug. 20 and Friday, Aug. 21, at Volunteer and Howard J. Lamade Stadiums in South Williamsport. 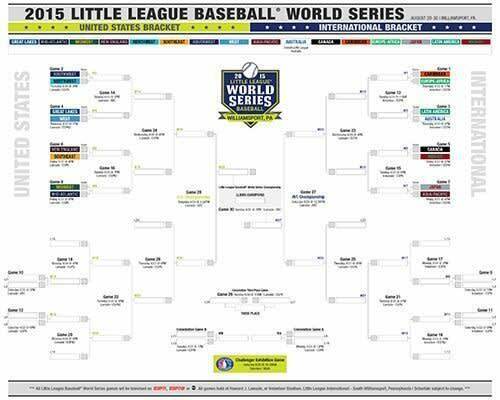 The 2015 Little League Baseball World Series concludes with the World Championship Game on Sunday, Aug. 30. The full schedule, bracket, and all information about the 2015 Little League Baseball World Series can be found on LLBWS.org. The individuals from the State College Little League Challenger Division who participated in the drawings will also be on the field at the 2015 Little League Baseball World Series Challenger Exhibition Game, when their teams face the Little League Challenger Division® from First Colony Little League from Sugar Land, Texas. The game will take place on Saturday, Aug. 29 at 10:30 a.m. at Volunteer Stadium, and air live on Northeastern Pennsylvania’s and the Central Susquehanna Valley’s PBS Station, WVIA, thanks to the generous support of the First Community Foundation Partnership of Pennsylvania. The Road to Williamsport is already underway, with Cronulla Little League winning the Australia Region Championship on Tuesday, June 9. Seven other teams from around the world and eight teams from the United States will continue to compete for a chance to represent their region over the next eight weeks. Learn more about the Region Tournament dates and locations. The Little League International Tournament is the premier baseball and softball tournament in all of youth sports. Amateur athletes from ages 11 to 18 will compete for championship banners in nine divisions: Little League Baseball (11-12-year-olds), Little League Intermediate (50/70) Baseball (11-13-year-olds), Junior League Baseball (12-14-year-olds), Senior League Baseball (13-16-year-olds), Little League Softball® (11-12-year-olds), Junior League Softball (12-14-year-olds), Senior League Softball (13-16-year-old), and Big League Softball (14-18-year-olds). The Little League World Series schedule kicks off with the Big League Baseball World Series in Easley, S.C. on July 28 and ends with the Little League Baseball World Series Championship Game in South Williamsport, Pa., on August 30. The 69th Little League Baseball World Series will follow a modified, double-elimination format. Four teams will be eliminated from advancing in the tournament by virtue of losing their first two games. Those four teams, two on each side of the bracket, will play “crossover” games – U.S. team vs. International team. This is the only time in the tournament, except the World Championship and consolation games, U.S and International teams oppose each other. All teams will play at least three games at the World Series, and all 32 games will be televised by the ESPN family of networks or ABC. The Little League Baseball World Series Championship Game is scheduled to start at 3 p.m. on ABC. In addition to the 32 Little League Baseball World Series games, more than 90 Little League games will be televised on ESPN, ESPN 2, ESPN 3, and WATCH ESPN, including all the championship games from the eight other Little League Baseball and Little League Softball World Series tournaments. The Longhorn Network will also televise 12 games from the Little League Baseball Southwest Region Tournament and the Little League Softball Southwest Region Championship Game. All coverage is subject to change. Learn more about the schedules of all the Little League Baseball and Softball World Series. WRAK (1200 AM/1400 AM/94.9 FM) in Williamsport will broadcast all games of the 2015 Little League Baseball World Series. WRAK is the flagship station for the English-speaking radio broadcasts of the World Series. The station has broadcast the World Series every year since its inception in 1947. For all updates on the Little League World Series tournaments and events, go to LLBWS.org and follow #LLWS on Facebook, Twitter, and Instagram.